FREE Fitness Schedule First 10,000 Members! Our new 80/20 Core Training, which is designed to focus on the core sections of your body, includes nutrition, healthy lifestyle habits, fitness, strength and endurance. What makes our method so effective is that we strictly focus on reducing unwanted belly fat through better nutrition and a better way of living. It's all about choices. You have all the power and control, so make the right choice!!! Start Today At No Cost!! Take advantage of our free membership! 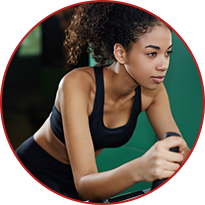 5Slim FITNESS, which is based in Detroit, Michigan, is an online service dedicated to naturally reducing unwanted belly fat while providing our members with a more distinguished appearance. Win with the body you are in-- 80% of our training is focused on nutrition and health, and 20% focuses on fitness and exercise. Fortunately, we don't use any weight-loss products or quick-reduction methods because many of them are harmful. Fad diets are rarely sustainable, since their weight loss is often water or muscle, rather than fat. Many diet pills and supplements enter the market before they are proven safe. Our 100% natural weight loss method only strengthen your body, promoting health and wellness. Our owner is a United States Veteran with more than 10 years of service, and this has made fitness a big priority for us. After leaving the military, our owner developed some techniques, where he was able to create a core fitness program that improves health and wellness. We are now inspired to share our unique 80/20 Core Training with the world, making fitness a priority!